A New Year brings new market opportunities - both Globally and in the Philippines. 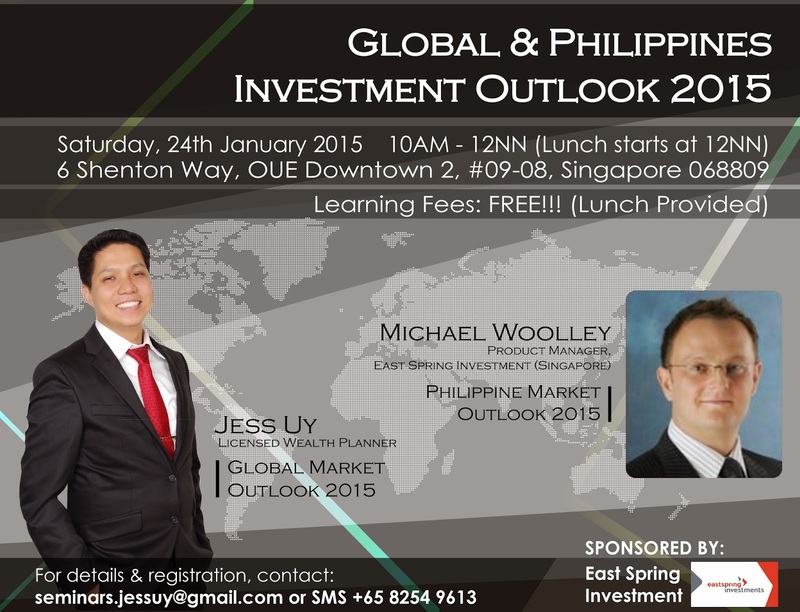 In this upcoming Investment Outlook 2015 seminar, I will be discussing global market trends for 2015. Major central banks are changing their policies as their economies move toward different paths. What trends should investors look out for in 2015? China is growing with the opening of the China A-shares market, what kind of impact will that have on investors’ global portfolios? Which markets and sectors should we consider and which ones should we avoid? How will the Philippine market stack up against other emerging markets? Which sectors and themes are worth considering for 2015? Join me for a morning of insightful discussions on major market trends and opportunities in 2015, together with investment specialist Michael Woolley (Eastspring Investments). This review covers an awesome session, who put us on the road to having our finances in order. We're hoping to sign up for more services a little down the road, when there's actually something for this team to manage!He was thorough and patient, spending way more time with us than we expected, helping us see where we could optimize savings and retirement planning. He helped outline our targets and did some broad planning with us - as a consultation!